Nestled in the dense forest of a private, gated community, you'll find this stunning Jasper vacation rental home. Look forward to relaxing at this secluded retreat while you bask in the natural beauty of the area. 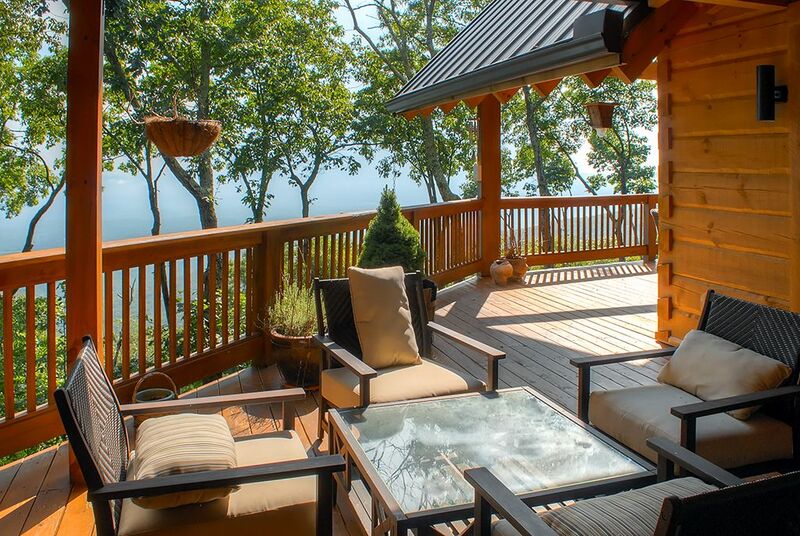 Perched at 3,000 feet elevation on 1 ½ acres of lush natural land, this 4-bedroom, 3.5-bathroom vacation rental has enough sleeping space to accommodate 10 guests, making it the perfect choice for a large family or group of friends on the ultimate North Georga Mountain adventure! As soon as you arrive at the property, you'll fall in love with its fantastic exterior, which boasts an outdoor gathering area and fireplace, wrap-around deck, and stunning 180-degree panoramic views of the mountains and the valley below. Once you enter the residence, you'll immediately feel at home. The open concept living space and 28-foot ceilings give the property a warm, inviting atmosphere. The main level provides plenty of room for you and your companions to gather and enjoy each other's company. Featuring antique heart pine floors from the original owner of the Dallas Cowboys were shipped from Dallas, Texas, the great room offers a flat-screen TV with cable for your entertainment. The bar area has an ice machine and beverage center, so you can whip up your favorite cocktails and sip them as you chat with your group. When you work up an appetite, head to the fully equipped gourmet kitchen, which features everything you need to cook a delicious meal. Enjoy your dinner at the spacious dining table, or take it outside and dine al fresco as you marvel at the view. On cooler evenings, stay indoors and cuddle up next to one of the 2 fireplaces. This remarkable home has 3 living spaces, all equipped with flat screen TVs, so you won't have to fight over what to watch! If you want something more active, the terrace level living area has a foosball table for your enjoyment. When you're ready to call it a night, this home provides plenty of options for sleeping. The roomy master bedroom has an ensuite bathroom with a 12x7 slate shower and heated Georgia slate floors. Before you slip off to sleep, take a moment to listen to the peaceful sounds of the natural stream, which runs adjacent to the room. In addition to the master bedroom, this cabin offers 2 additional bedrooms, one with a queen-sized bed and one with a king-sized bed. Not to mention, the loft is equipped with 2 sets of twin-over-twin bunk beds and an additional twin-sized bed, so there's plenty of sleeping space for everyone here! If you can pry yourself away from this magnificent home, there is plenty to do in the gated community and surrounding areas to keep you entertained! There's a large lake, which is perfect for fishing or swimming. If you'd rather swim in a pool, there are 2 outdoor pools in the community, one for families and one for adults. For something more competitive, tee off at the first class Joe Lee designed golf course or compete in a game of tennis at the tennis courts. Don't forget to make use of the excellent hiking trails throughout the community. When you venture a bit beyond the gated community, you'll find a multitude of options to fill your time. In the town of Dahlonega, approximately 20 minutes away, you can take an old gold mine tour and learn the history of the area. The property is also midway between Atlanta and Chattanooga - each city has plenty of attractions including state of the art aquariums. If you're looking for something less urban, approximately 20 minutes away in Dawsonville is Amicalola Falls State Park and Lodge, which boasts hiking trails, waterfalls, and even whitewater rafting. The town of Helen is approximately an hour away and Blue Ridge, where you can take an antique train ride to Tennessee, is about 45 minutes from the property. Whether this Jasper vacation rental home will serve as your home base for exploring the area or a place to escape the hustle and bustle of everyday life, it will quickly become a place you want to return to year after year! - Amenities include 4 flat screen TVs, 3 fireplaces, WiFi, an elevator, gourmet kitchen, ice machine, and beverage center, wrap-around deck, and much more! Gorgeous home that's perfect for a couple of families to share! This is a really nice, upscale home that has it all! Beautifully decorated and ample space for multiple families with kids to enjoy. The views are gorgeous! The road up the mountain was a bit intimidating at first, but we quickly got the hang of it and the home is worth it! This cabin home is so beautiful. It is modern and clean with the most amazing mountain views I've ever seen. Fantastic trip. The house is spectacular and the views breathtaking. The owner was very attentive and made sure we were comfortable. We hope to go back! Enjoyed our stay in this wonderfully appointed cabin. Lots of room for three families. Huge kitchen for multiple cooks. Loved sitting in front of the outdoor fireplace with a glass of wine. The owner graciously left some for our enjoyment. The kids loved the tree house. Great place - has everything you could want for a restful weekend getaway. Specatcular place. We loved it! This was our second stay here and everything was wonderful. This is a beautiful home with incredible views and everything is first class!